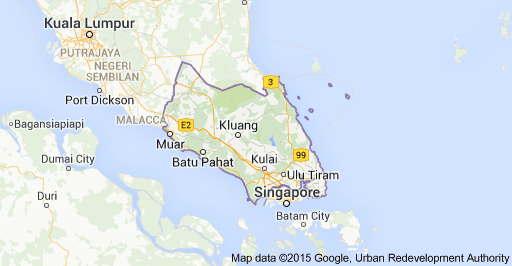 Johor is a Malaysian state, located in the southern portion of Peninsular Malaysia. It is one of the most developed states in Malaysia. The state capital city of Johor is Johor Bahru, formerly known as Tanjung Puteri (Malay for Princess's Cape). Its royal city is Muar. The old state capital is Johor Lama. Johor is surrounded by Pahang to the north, Malacca and Negeri Sembilan to the northwest, and the Straits of Johorto the south which separates Johor and the Republic of Singapore. The state also shares a maritime border with theRiau Archipelago from the east and Riau mainland on the west by the South China Sea and the Strait of Malaccarespectively, both of Indonesian territories. Johor has the second largest population in Malaysia at 3,230,440 as of 2010.The state's ethnic composition consists of Malay 54.1%, Chinese 30.9%, Indian 6.5%, other ethnic groups 0.4% and non-citizens 8.1%.